Shopping for myself now that I’m a mother has taken on a new kind of meaning since I love buying clothes for the boys versus for me. But when I select pieces now to add to my wardrobe, functionality and comfort are definitely a priority. I want to wear things I can move in while taking care of the boys, yet, have character and fit in with my style aesthetic. I think there’s a stigma of being a mom and having to dress a certain way that can be viewed as negative. Or, being a mom means you have to forget about your sense of individuality and self. For me, I want to be that stylish lady that happens to be a mom. Hopefully, a cool one. Let’s ask my sons in a couple of years what they think of me and how I look… Should be interesting! For our first outing, a trip to the park for a craft fair, I wore something gypsy inspired that I picked up from Urban Outfitters. This jersey tank dress was the perfect choice as it kept me cool, and had some wit to it. Each daily horoscope on the dress reads “The stars and planets will not affect your life at all.” Paired with gladiator sandals and a fringed bag, this outfit is totally my Coachella mom look. 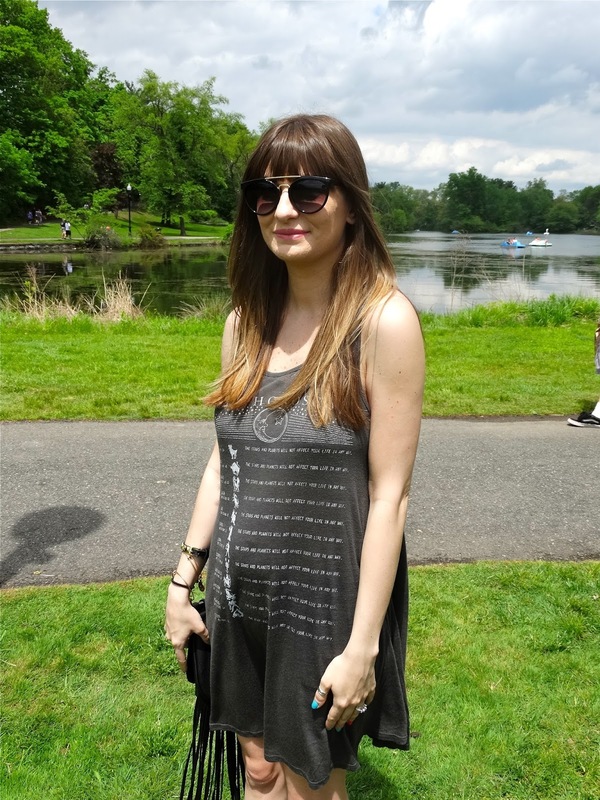 Looking forward to adding more tank dresses to my closet – easy to style, easy to wear!